The first is my favorite - I've been waiting for this one ever since I saw it after their retreat last year. 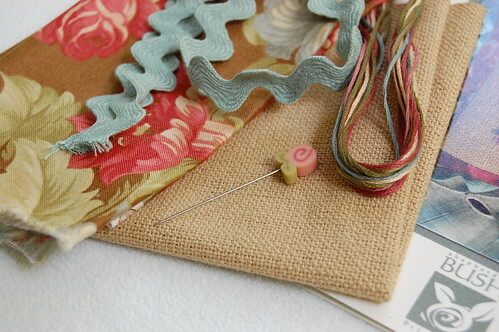 I'm actually thinking of using a different linen. Maybe Light Examplar (pictured underneath) instead of the R&R French Vanilla. 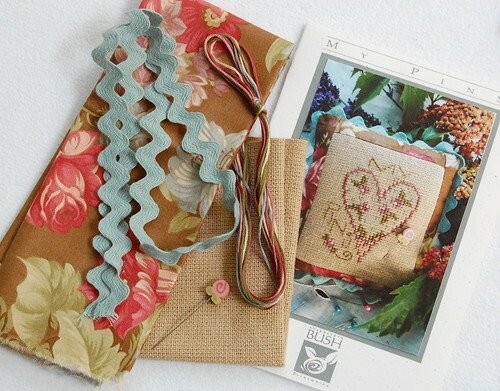 The next is a very sweet kit that comes with beautiful fabric, ric rac, and a very sweet pin (DMC threads and linen too). And the last is another sweet and simple kit. I just love these tall pudgies. They are so cute. While at Amy's I worked on The Riddle a little bit. I'm getting very close to finishing! I'm also getting close to running out of the dark green thread. I may have to put it on hold until I can get some more. 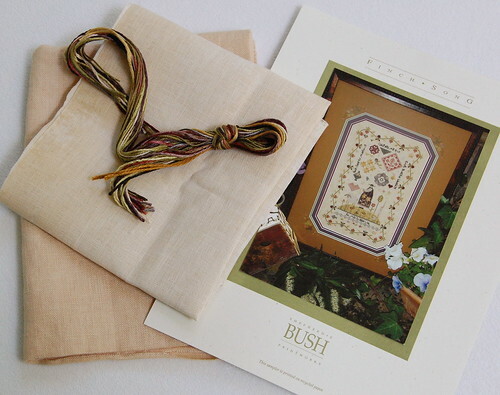 In other news.... Paulette the designer of Plum Street Samplers is having a great giveaway at her blog for her three year blogiversary. There is also a very nice freebie she designed for the occasion. Be sure to leave a comment! She is such a sweet person and a terrific designer! And today is my baby Matthew's birthday. He's three today! I can't believe my baby is three! It seems like just yesterday that I was in the hospital with him. And now he's my little monster! I love all the Shepherd's Bush designs you got. They are one of my favorite designers. I love the riddle...your stitching is lovely. 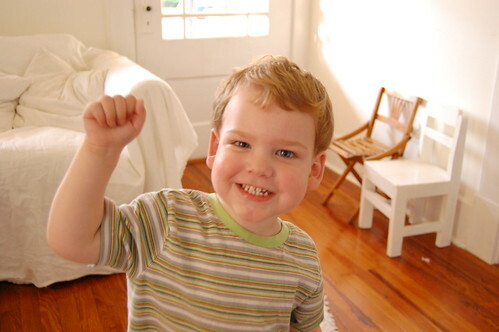 Your son is adorable - 3 is such a great age! I can't believe how much you have completed on The Riddle - it's beautiful. Happy birthday to your son~~~ He is adorable!! Great stash you got there!! Those pins are so cute!!!! Love your stash, I just recently finished my first SB (Red Snowman) it won't be my last. Can't wait to see more of riddle. The Riddle is coming along famously! Never been a DT fan but this one is speaking to me...wants to be added to my stash! Also, great stash...SB kits are fun! Those Shepherd Bush designs are too cute. I can't believe Matthew is 3@! Seems as if you were just posting pictures of him as a baby. I sooo miss having a Zaxby's nearby. I used to eat there for lunch once a week. They just closed down the Whataburger near work.. I'm hoping they turn it into a Zaxby's. I just looked at the website and the closest one to me is in Valrico... I think I may have to go there soon.. Really soon. :) Being pregnant can be my excuse to drive so far. Happy Birthday to Matt! I can't believe that he is 3! I still think he's a baby! Your "Riddle" is just fantabulous! A very Happy 3rd Birthday Matthew! Yummy new stash...looking forward to seeing My Pins ;) And you are really making fast progress on The Riddle, it looks wonderful! The Riddle is almost finished! It looks lovely. I hope you get your thread soon so you can finish it. Love your new SB stash. Your little guy is cute. He looks "full of beans" and older than 3! Happy B-day to Matthew. What a big guy! Your new SB kits look like loads of fun. And your progress on the Riddle ... amazingly, almost finished! I love all your stash haul, I love Shepherd's Bush charts as well and have slowly been collecting some. We share the same weakness, Nicole. As you know I just adore SB kits too! These ones you've got are all gorgeous. Thanks A Lot really appeals. You're breezing through The Riddle! It's looking so good. Happy bday to your little one too. :) They grow up so fast. I love how your Riddle is coming along - the white in the design is so pretty. The Riddle is coming out so wonderful. I have this in my stash and I sure hope to get to it soon. Your Matthew is a total cutie. Happy Birthday Matthew. Felicidades para su precioso bebé y sí ,los niños crecen tan rápido que apenas nos damos cuenta. Sus labores como siempre son magníficas!!!! Congratulations for your marvelouse baby and yes, our babies grow up so quick we hardly notice. Your stiching works are brilliant as always!! Happy birthday to your sweet little Matthew! Wow, I can't believe he's three already! Your progress on The Riddle--WOW! YGG!! You'll be happy dancing in no time. Love the new stash, too! Oh,Nicole, those SBs are the very same I've ordered. I love the Finch so much. Can't wait to get my hands on it. Great stash haul, Nicole! I love the charm of Shepherd's Bush designs. 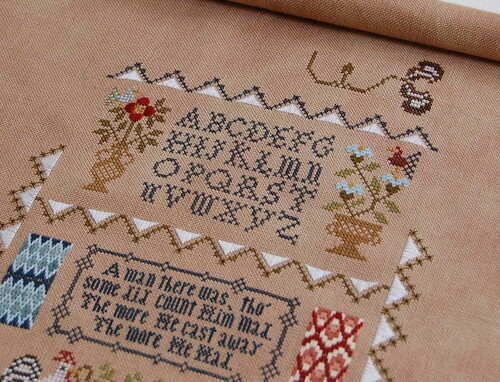 Lovely, lovely stitching on The Riddle. Sure hope that green thread holds out! Your Riddle looks fantastic, Nicole! I like the colors and the humor in the piece! Finch Song is really pretty. I think it would look beautiful on either linen. And Happy Birthday to your Matthew! He has grown so much! Your Riddle is gorgeous - love it! Congrats on your DS' BD - he's a cutie! Nicole, your progress on the Riddle is wonderful. I love seeing your progress every time you post. And Finch Song - I can't wait to see your start on that - I love the kit and know I'll break down at some point. Happy Birthday Matthew!!! They do grow so very fast! Love the stitching and great new stash!! What a cutie, belated happy birthday to him :-). Love all your bits and pieces, I got my Finch Song on Sunday. I hate to admit it, I haven't even pulled it out of the package yet. I may copy and change my linen like you. 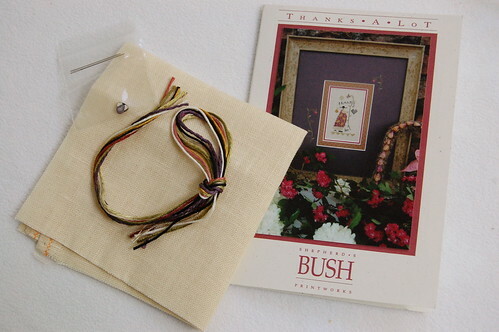 Love the Shepherds Bushs' you've gotten...the My Pins is really pretty...watch out, they grow up REALLY quick. Don't blink too much..you'll miss it all. I love your new SB kits. And certainly the old ones too. You've got a sweetie son. Holy cow! I can't believe Matthew is three, either! Happy belated birthday to your dear, sweet baby!